The switchyard for units 3 and 4 of the United Arab Emirates' Barakah nuclear power plant has been energised and connected to the electricity transmission grid, the Emirates Nuclear Energy Corporation (Enec) announced today. Key power transformers at Barakah 2 have also been energised in preparation for hot functional testing. Energisation of unit 3 and 4's switchyard, which connects the plant to the transmission grid and allows it to draw power, is essential for future testing of the units. Connection to the grid will also allow for the completion of additional auxiliary buildings at both units, Enec said. The switchyard for Barakah 1 and 2 was energised in February 2016. The energisation of Barakah 2's main power transformer, excitation transformer and auxiliary power transformers allow for the start of hot functional testing at the unit. These tests ensure that the reactor's systems, including coolant systems and nuclear safety systems, function safely under the reactor's operating pressure and temperature conditions before any nuclear fuel is loaded. "These milestones are a result of our extensive collaboration with our prime contractor and joint venture partner, the Korea Electric Power Corporation (Kepco)," Enec CEO Mohamed Al Hammadi said, adding that the teams had benefitted from experience gained when conducting the same work on Barakah 1. Four Korean-designed APR-1400 units are being built for Enec at Barakah by a consortium led by Kepco. Construction began on the first unit in July 2012, unit 2 in May 2013, unit 3 in September 2014 and unit 4 in September 2015. 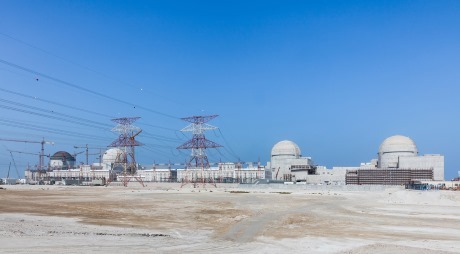 Unit 1 is now in the commissioning and testing phase, and is waiting for the UAE's Federal Authority for Nuclear Regulation to issue an operating licence before fuel loading can commence. Unit 2 is now more than 90% complete, unit 3 more than 79%, and unit 4 more than 60%. All four units are currently expected to be in service by the end of 2020.